• On an iPhone 7 or iPhone 7 Plus. Press and hold both the Sleep/Wake and Volume Down buttons for at least ten seconds, until you see the Apple logo. • On an iPhone 6s and earlier, or iPad. 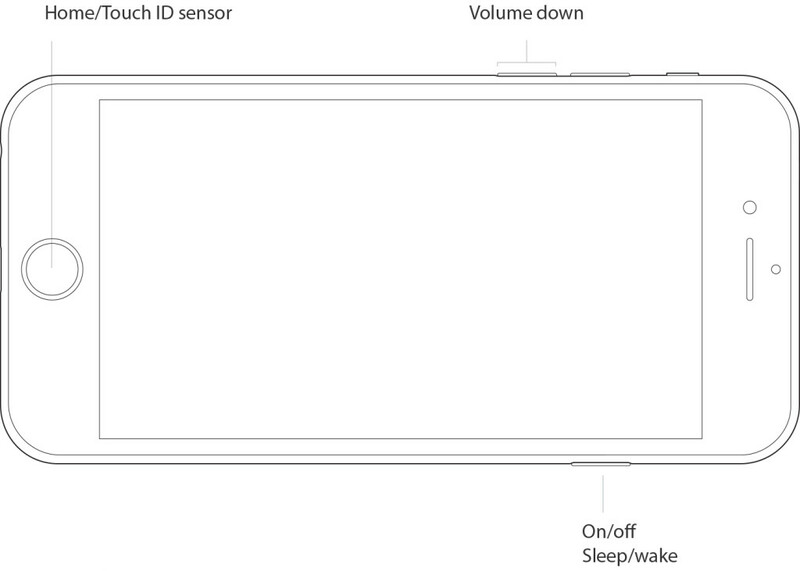 Press and hold both the Sleep/Wake and Home buttons for at least ten seconds, until you see the Apple logo. To simply restart, see support.apple.com/HT201559. automatic backup solution, you want to restore content to your device from almost anywhere using Wi-Fi, you don’t connect your device to a computer very often, or you don't own a computer. Use iTunes if you frequently use the computer that hosts your backups, you don't have an iCloud account or don't want to use iCloud, you want on-site and networked backups, or you'd like to have a manual or secondary backup to use with your iCloud back up. For more information on back up options, go to support.apple.com/HT204136. 2. Tap Settings, then scroll down and tap iCloud. 3. Scroll down, tap Backup, and make sure that iCloud Backup is turned on. Tap Back Up Now. 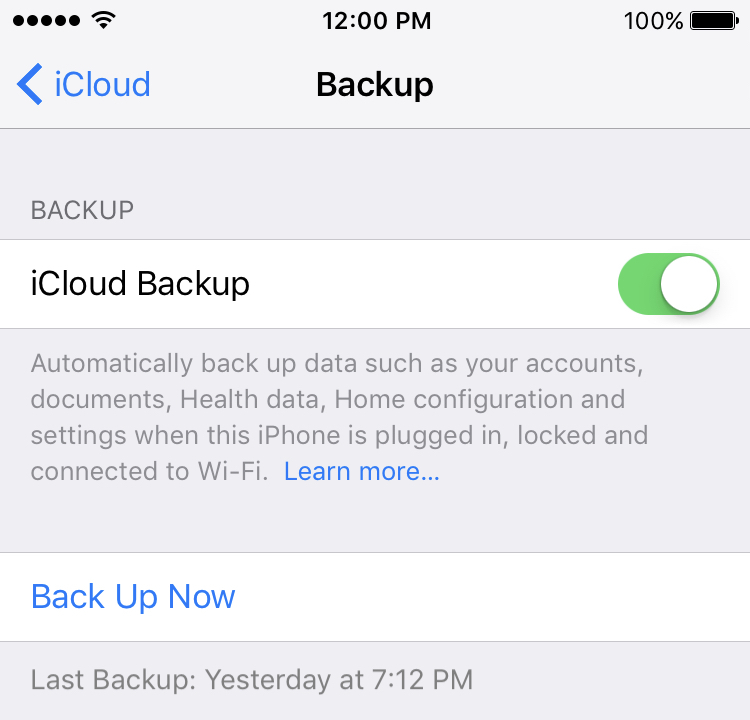 After you turn on iCloud Backup, iCloud will back up your content automatically. You can return to this screen to see when the last back up happened. Use a broadband Wi-Fi connection and plug your device into a power source when backing up. To back up using iTunes, go to support.apple.com/HT203977. 1. Turn on your device. You should see a Hello screen. 2. Follow the steps in the iOS Setup Assistant until you reach the Apps & Data screen, then tap Restore from iCloud Backup. 3. Sign in with your Apple ID, then choose a backup. To restore using iTunes, go to support.apple.com/ht204184. 2. Enter your Apple ID, then click Continue. You can then see how to reset your password depending on security features you're using with your account. If you know answers to your security questions, select “Answer security questions” and follow the steps. If you select “Get an email,” Apple will send an email to your primary or rescue email address to reset password. If two-factor authentication is enabled, you can reset password from your trusted iPhone, iPad, or iPod touch or on iforgot.apple.com. These steps will work only from a trusted device with a device passcode enabled. If you set up two-step verification, you will need your recovery key and a trusted device to reset password. For full article, go to support.apple.com/HT201487. Find My iPhone includes Activation Lock—a feature designed to prevent others from using your iPhone or iPad if it's ever lost or stolen. Activation Lock is enabled when you turn on Find My iPhone on iOS 7 or later. Do I need to turn off Find My iPhone before service? Yes. If Find My iPhone is on, technicians might not be able to perform service on your device. 1. Tap Settings > iCloud. 2. Scroll down, tap Sign Out, then tap Sign Out again. 3. Tap Delete from My iPhone and enter your password. 2. Sign in with your Apple ID (the one used with iCloud). 3. Click All Devices, select the device sent for service, then click Remove from Account. 4. If you don’t see Remove from Account, click All Devices again, then click the Delete button next to the device. For full article, go to support.apple.com/kb/PH21251.